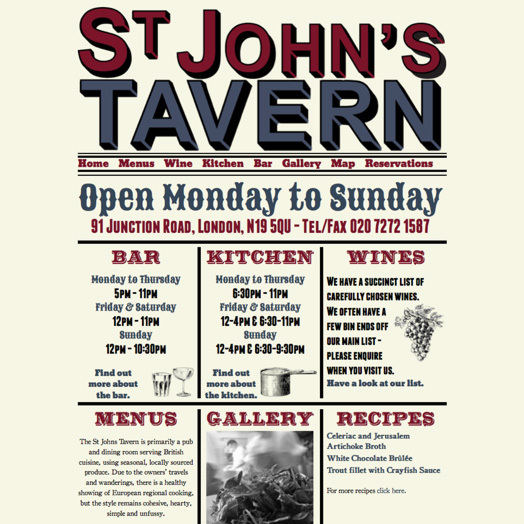 St John's Tavern in Archway is a successful gastropub with a large dining room. The restaurant regularly changes its menu and there is an extensive wine list. The owner of St John was keen to get a new web site as he felt his existing site didn't reflect the nature of the pub. He contacted me having seen the site I built for The Empress. The site uses a wide range of unusual fonts. To ensure that these quirky typefaces always display correctly, they are embedded in to the site. Regardless on what device the site is viewed, the fonts always render correctly and because fonts are used, rather than using images, the content is fully searchable by search engines. Images of the pub and restaurant uploaded to the site are categorised on upload. Galleries around the site then show images appropriate to their context - eg shots of the kitchen on the kitchen page. The site generates image gallery thumbs as black and white images and displays colour images in pop-ups. This is a great time saver as all the work that would traditionally been done in Photoshop, or a similar image editing package, is now performed by the site instead. I also set up a Facebook page for St John, as I did for Green Lane Primary, which uses the Facebook tabs feature. Visitors to their Facebook page can view St John's menu and wine list within Facebook. The tabs in Facebook are automatically updated when the wine list or menu is changed on the main St John site.